Welcome to the eMachineShop supplier guide. 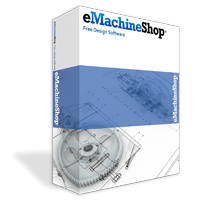 These pages will help you work with eMachineShop and increase your business. Please give this information to the appropriate people. For questions or comments about a specific order, include job number in the email subject line and send to orderserv@emachineshop.com. To accept an order, write in the message body: *ORDER ACCEPTED*. For questions not relating to a specific order use alex@emachineshop.com . For non-conforming parts please advise us of the non-conformance and ask whether to ship. However if we advise to ship, we reserve the right to reject based on final inspection. To decline an RFQ (Request for Quotation): write in the message body: *NO BID*. If a small change to the design would allow you to bid, please indicate the desired change. To request a material substitution: provide the closest available material. Example: "Order accepted providing material substitution 6061"
Break all edges 0.1-0.4 mm or .003"-.015" (+/- 5 deg). Remove all burrs, chips and loose particles – none should be visible under a 10X magnifier. (Material thinner than .23mm (.009") does not need edge breaks.) For wire EDM, laser, plasma cutting and waterjet, grind off any protrusion at start/end of cut. Ensure any grinding meets the surface roughness specification. When no finish is specified on a purchase order, no finish is needed. However parts must have a uniform professional appearance without significant variation in color, texture or lay. Parts that are excessively sanded or polished to cover up poor machining will be rejected – properly machined parts need little or no sanding/buffing. Surface and edge roughness specs must be met – the Surface roughness spec applies to all surfaces – outer and inner. Dents or scratches from clamping, bending, holding or otherwise must not exceed the surface roughness spec. For finishes requiring an electrical contact, place contact in least visible location. Remove all grease, oil, dirt, particles, chemicals, coolant, bonded and unbonded chips/slag, chemical residue, stickiness, discoloration, markings, smell and other foreign material and substances from parts, including holes. Any coolant residue left on parts will quickly tarnish certain materials. Before wrapping make sure parts are fully 100% dry otherwise severe discoloration can occur. Do NOT apply oil or rust-prevention to parts – unless specified. Do not use hand-held tapping tools – they make threads that are not perpendicular to the surface. Use class 2B taps for inch and 6H for metric. Countersink holes (~ pitch/2) before tapping to avoid burrs. For drill diameter and limiting dimensions, use ANSI/ASME B1.3M-1986 (ignore the minor diameter spec on the drawing). Tooling: Gates and ejector pins must be in least visible location and must be approved by the customer before mold creation (for example, inside a 5-side box). Drawing is after shrinkage – adjust tooling accordingly. Run: Use automatic machine. No pitting, flow marks, non-uniform color, flashing over 0.2 mm or air bubbles over 0.1 mm. Holes, edge breaks and filets must be built into the tooling. Drawing is after shrinkage – adjust tooling accordingly. For jobs that require custom tooling, store tool for two years. Mark tool "emachineshop # ____ ". Tooling is the property of eMachineShop. You must do full proper dimensional and visual inspection prior to shipping. Inspection must be done by someone other than the machinist. The inspector must have the CAD file and the technical information from the purchase order email. Check all implicit and explicit measurements described above and conformance to any note. If inspection finds non-conformance do not ship – email eMachineShop for instructions. The Back view establishes the base plane or Z alignment, which must be established prior to X-Y axis alignment. ANSI Y14.5 shall apply. In conformance with industry standard, design dimensions are after non-organic and mechanical finishes (anodize, plate, brush, grind, sand blast etc.) but before organic coatings (powder coat, paint, etc.). Example: A 10 mm cube that was ground should measure 10 mm after grinding. You must pack parts for full protection against all types of damage. Our policy is that you, the supplier, takes full responsibility for any damage – not the freight company. If parts are damaged we will assume it is due to poor wrapping/packing. You are responsible to get parts to us undamaged. If parts are damaged you may be required to remake the parts at your cost and pay for the extra shipment. Please show this video to your shipping person. Please print this page and provide to your shipping department. Too often we have seen suppliers spend weeks making valuable parts only to have them packed with too little cushioning and get damaged in transit – don’t let that happen to you. Do not use staples, excessive tape, old wrapping materials, bubble wrap , Styrofoam (crumbles). Protect weak parts from heavy parts. Use new strong boxes – 200 lb/sq in for single wall or 275 lb/sq in for double wall. Parts push right thru and fall out of weak corrugated material. Follow the packing instructions shown on each order – those instructions are based on years of experience shipping machined parts around the world. Tariff code must be shown on shipping papers. The tariff code will be indicated in Purchase Orders. Put 1 copy of invoice inside box and additional copies on outside per regulations. Consolidate – When you have a job ready to ship but another job will be ready in 1 or 2 days, wait and combine the shipments. But don’t exceed per box 25 kg (55 lbs); don’t exceed 1.7 m (66") for length + width + depth; don’t combine very odd shapes like a large cube and long pole; don’t combine a job that can go in a box with a job that goes in a crate; don’t combine a job valued over $2,000 with other jobs. Bundle parts of one job together and identify by job number. Do NOT use printed UPS boxes over 10kg – UPS charges extra. Call your local UPS office to request a pickup. 201-280-8868 or alex@emachineshop.com tel: 201-962-7511 x 115. Overseas fabs: For shipping, the freight company will handle clearance. You only need to have the material ready for inspection. If shipper asks for more info about parts, tell to call eMachineShop at 201-962-7511.